Monowave 50 even fits into a crowded lab. High level organic synthesis is performed simply with the reactor, a vial and a silicone cap. Ideal for educational purposes, Monowave 50's safety standards ensure the safest handling even with inexperienced students. You save money, time and space as Monowave 50 provides the best combination of price and quality. Since Monowave 50 works in a similar way to a microwave reactor, our world of microwave synthesis will be of great help to you to optimize your chemistry. It includes a database of more than 1000 applications which have been successfully performed in Anton Paar reactors. 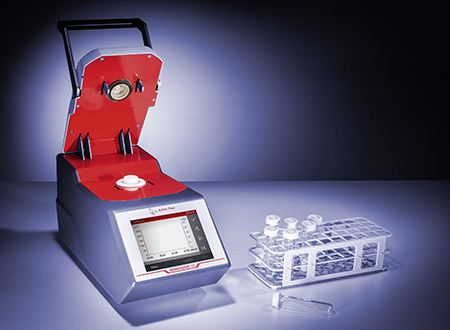 Each chemist should have the modern and easy handling Monowave 50 reactor in the laboratory. Sealed tube chemistry has never been easier and safer than with this device.